ERCOFTAC will host Wind Load on Structures: Modelling & Simulation Best Practices and Technology Trends on April 4-5, 2017 at the Danish Inst. of Technology, Copenhagen, Denmark. Turbulent wind loads are prevalent across a myriad of engineering structures, whether as micro-climate – terrain interaction,inducing locally strong gusts on village houses, or a Wind Turbine farm, to hurricane weather systems, dangerously buffeting cranes perched on high rise buildings, under construction, across the Miami skyline. MSC Software Ltd. and Software Cradle Co., Ltd. have announced that MSC Software Corporation has acquired all of the stocks of Software Cradle on December 15, 2016 and Software Cradle has become an MSC Software company. 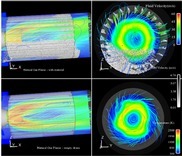 Software Cradle is a Japanese firm highly valued as an innovative computational fluid dynamics (CFD) software vendor for automotive, turbomachinery, electronic, building and civil engineering sectors. Cost reduction is a driving force in pump design. The manufacturing cost of centrifugal and mixed pumps generally varies with the volume of the pump. To reduce manufacturing costs, the pump diameter must be reduced for a given head which results in an increase in head coefficient. The latest release of Pointwise’s computational fluid dynamics (CFD) mesh generation software has been extended such that its Tcl-based Glyph scripting language can be called from any scripting language including Python. This new Glyph Server feature was motivated by a user’s presentation at the Pointwise User Group Meeting 2016.